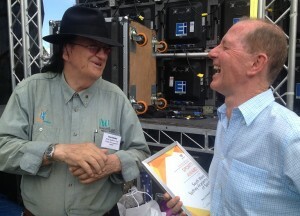 Happy cobbers: award winners Ken Cooke and Gerry Knights share a laugh backstage earlier today at Woodward Park. Doctor James Toh, a high achieving surgeon, lecturer and researcher at the Ingham Institute has been named Liverpool’s 2016 Australia Day Citizen of the Year. Dr Toh, who received his award from Liverpool mayor Ned Mannoun at Woodward Park this afternoon, has previously won the University of NSW Dean’s prize for teaching as well as the Liverpool Hospital Best Registrar award. His research at the Ingham Institute won the 2015 Colorectal Surgical Society Australia New Zealand research prize and recently he won a Royal Australian College of Surgeons Foundation Research Grant. But they weren’t the only locals to shine on Australia Day 2016 as two others from Liverpool were named in the national Australia Day honours list released by the Governor-General. They were Chief Superintendent Peter Gillam, the Liverpool Local Area Commander, who received the Australian Police Medal. Chief Superintendent Peter Gillam joined the NSW police force as a trainee in 1978 at the NSW Police Academy, Redfern. He attested as a probationary constable in 1978 and was stationed at No. 22 Division (Liverpool). He was posted to his current command in 2013. The second winner was Liverpool resident Bruce Bell, who received an Order of Australia Medal for his service to marine rescue through his role in the Australian Volunteer Coast Guard (now called Marine Rescue NSW). A new vessel was named Bruce Bell in his honour in 2004. Honours: senior citizen of the year Elizabeth Winner, young citizen of the year Lilly Lyons and citizen of the year Dr James Toh wait to be called up to the stage. • Macquarie Award – St Luke’s Anglican Church. Young Citizen of the Year Lilly Lyons, 13, is making her mark for her work with the Liverpool Youth Council and as the host of a weekly radio show called RADA on community station 2GLF. Senior Citizen of the year Elizabeth Winner has been volunteering since 1986, adding up more than 31,000 hours of unpaid work. 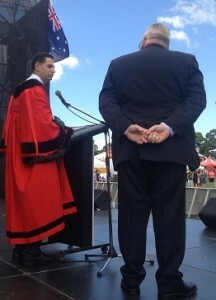 The popular South West Sydney Academy of Sport chief executive Gerry Knights was on hand to accept the sport award from Mayor Ned Mannoun. “This is a wonderful award on its own, but this honour will also help us win more corporate support so we can then provide more programs for our athletes,’’ Mr Knights told the South West Voice. 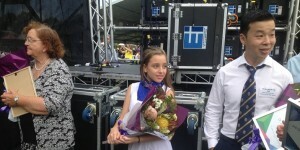 “We’re really happy to win this Australia Day award,’’ he said. Mayor Ned Mannoun on stage at Woodward Park today. 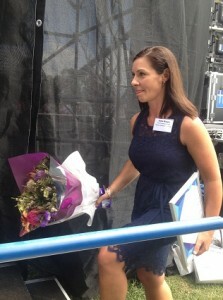 Health Research award winner Kylie Wright has given outstanding service to the local community in the field of neuro-oncology health research and through coordination of the Local Health District Brain Tumour Support and Education Group, which she co-founded. Small Business Award winner Minuteman Press Liverpool opened in Liverpool in 2014 when Adam Anderson decided he wanted to help local businesses grow. He has contributed to local fund raising efforts for Shine and Share Care and was elected to the Board of the Liverpool Chamber of Commerce and Industry. Cultural and Arts award winner Mikaela Conners, another high achiever from Liverpool, took out the 2015 Australian Chocolate Couture title at the Lindt Chocolate Awards and other awards. Fraser Environment Award winner Ken Cooke has been a volunteer member of Liverpool City Council Environment Program since 2009. The inaugural winner of the Macquarie award, St Luke’s Anglican Church, has been part of Liverpool since 1819, which is a lot more years than the main requirement of this category, 50 years or more of serving the local community. ♦ Mayor Mannoun also presented certificates to the winners of this year’s Order of Liverpool awards. Pam Valentine, who has volunteered for over 40 years with various community organisations. Bob Brassell, acolyte (priest’s assistant) at All Saints Catholic Church for many years. Christine Frame has been a member of the Historical Society for many years, helping to raise funds for the Museum in Liverpool. Ian Willmington has been a member of the Austral Progress Association for 35 years, as well as a committee member of the Outer Liverpool Community Service. Dulcie Davis has been the President of Liverpool Widows’ Club and President of Liverpool Branch War Widows’ Group for 10 years. George Csanady has dedicated many hours to the community church at Moorebank and Hammondville. Roy Wright has been the Vice President of the Lions Club for many years and volunteers for Meals on Wheels and Liverpool Hospital. Florence Hanna has volunteered for Liverpool Meals on Wheel, Red Cross, writing greeting cards to clients on their birthdays. David Pack was made an honorary member of the Order of Liverpool. Since 1990 he has worked for the Liverpool community in a voluntary capacity. 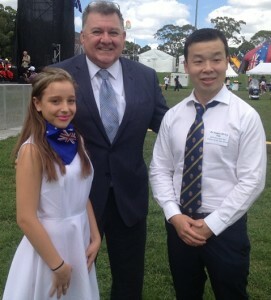 Popular Liberal MP Craig Kelly (Hughes) congratulates Liverpool’s young citizen of the year Lilly Lyons and the citizen of the year, Dr James Toh.